We provide a wide range of floral buttonholes (also known as boutonnières in French) to suit weddings, school formals, graduations, gala balls, funerals, or any other occasion you may desire. Ideally, boutonnières should compliment your attire, the other flower arrangements, and the theme of the event. According to common tradition, floral buttonholes (boutonnières) usually were made with specific flowers for certain special days and events including carnations, clove red, blue cornflower, white gardenia, red roses, white roses, primroses, poppies, orchids, green carnations). However, with most things in the modern era, tradition merely lends itself as an inspirational sounding board rather than a strict rule. 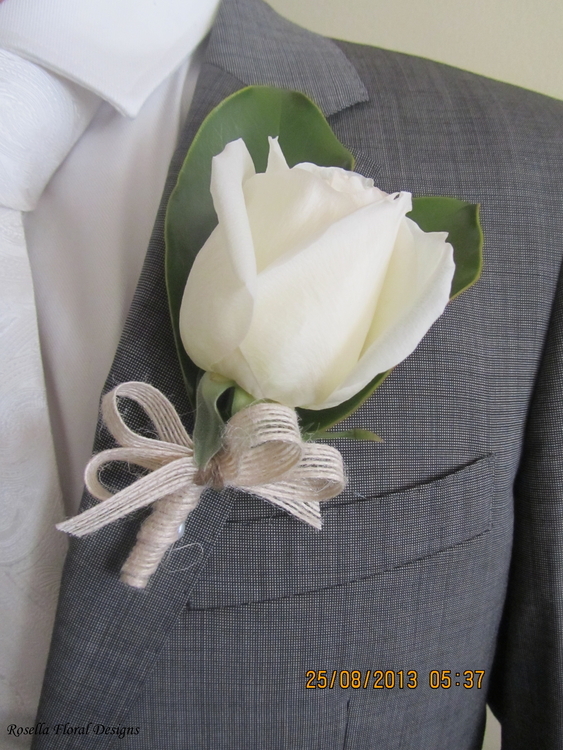 When it comes to the usage of buttonholes (boutonnières) in wedding tradition, they are historically worn by the groom, best man, groomsmen, ushers, pageboy, fathers, grandparents, and brothers of the bride and groom. However, in the current era, tradition has changed and you may want to reflect the hybrid family scenario by recognising the importance of stepfathers and parents de facto partners. Please refer to the following to see a range of buttonholes (boutonnières) we have created in the past.